STATIC SITE GENERATORS AND PHP WHAT IS A STATIC SITE GENERATOR? ▸ A script or application that runs ofﬂine to combine content and templates into a set of ﬁnalised, static web pages. ▸ Content is commonly stored in Markdown ﬁles under source control. ▸ Often use an established templating library (Twig, Handlebars, Liquid etc) ▸ Deployable output requires no execution or interpreting by the web server. WHAT ARE STATIC SITES GOOD FOR? ANY SITE THAT DOESN'T NEED DYNAMIC CONTENT. James Titcumb @asgrim WHAT ARE STATIC SITES GOOD FOR? I’M A FAN OF THEM WHERE A SITE CONTENT CHANGES RARELY (QUARTERLY / ANNUALLY PERHAPS)… BROCHUREWARE TYPE SITES. Steve Kirtley @stevekirtley WHAT ARE STATIC SITES GOOD FOR? THE SECURITY ASPECT IS A BIG PLUS FOR ME. WITH NO SERVER-SIDE SCRIPTING LANGUAGE INVOLVED THE ATTACK SURFACE DROPS THROUGH THE FLOOR. Nev Stokes @nevstokes WHAT ARE STATIC SITES GOOD FOR? THEY'RE HANDY WHEN YOU WANT THE HOSTING SETUP TO BE AS MINIMAL AS POSSIBLE (FROM GITHUB PAGES, OR AN S3 BUCKET, FOR INSTANCE). Tom Hazledine @thomashazledine WHAT ARE STATIC SITES GOOD FOR? WHAT ABOUT, YOU KNOW, ACTUAL FUNCTIONALITY? HOW CAN I DO THIS IN THE PHP? STATIC SITE GENERATORS AND PHP IN CONCLUSION ▸ Static sites are good ▸ Serverless is cgi-bin for hipsters ▸ SSGs for PHP are a thing ▸ I’ve been @drewm ▸ You’ve been lovely, thanks! 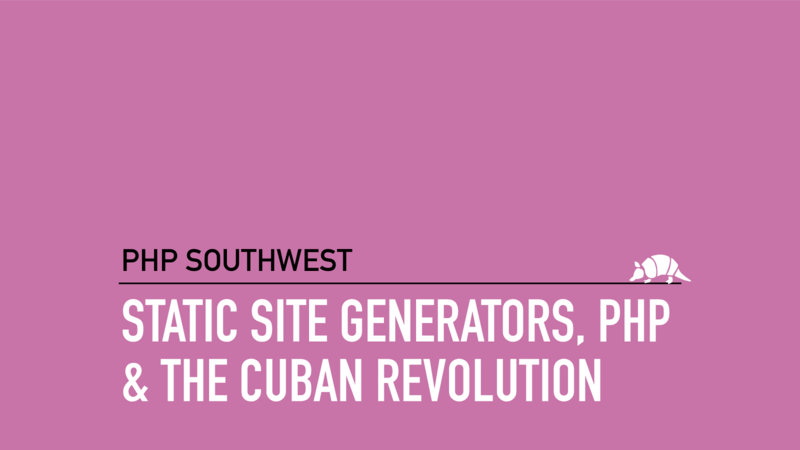 View Static Site Generators, PHP and The Cuban Revolution on Notist. Everyone's talking about static site generators these days, but are they craycray or is there something to this? What are SSGs good for, what are they bad for, and how can we use them as part of our PHP toolset? This event used Joind.in to gather audience feedback. The crowd @phpsw tonight. Room holds 70 and is rammed.